I know that may sound a bit like the start of a fairy tale, but it's not. Somehow the words "quaint French village" conjure up the idea of a story to me, a little fairy tale of sorts. Maybe it does for you, too. I must say that when I first arrived in Amboise, and started driving over the bridge which crossed the River Loire, staring at the Chateau d'Amboise towering over the town from the top of it's hill - it sure seemed like a fairy tale village. It still feels that way, almost a year later. I always think of myself as a person who would prefer the city. Yes, I love remote spots and landscapes as much as anyone, but when I think about loving somewhere...well, I lean towards being a city and enjoying all it has to offer. But after just a few minutes in Amboise, I was ready to throw all that nonsense out the window and live there, just relaxing at the cafes and breathing in the clean French air all day (yes, there were people smoking but come on, that's ruining my visualization!). One afternoon we clambered up the long, steep walkway to enter the Chateau d'Amboise and see things from a different perspective. Being the photo-addicted person that I am, I ran around like a ferret on a double espresso and took loads of shots. At some point I realized that if I got up to the edge of the retaining wall, I could see down over the town, so that's what you are seeing in the images today. These are just views that I saw while leaning over the wall at various points around the perimeter. Such a view! Isn't this a storybook village? Don't you want to go now? I sure do want to return! Well, hot on the heels on my last iPhone post from France...here's another one: this time, lovely Amboise! As I mentioned last week in my iPhone post, I am way behind but I am sure trying to catch up. I'm sure that happens to all of us photographers. We shoot, process and share...then realize we have skipped over a bunch of stuff! It happens to me all the time. Since I process my photos out of order, I am always in my Aperture library looking at shots that I have taken on all sorts of trips to all sorts of places...and I frequently find some real gems and wonder why I didn't get to them sooner. It's really the same with my iPhone. While I don't have nearly as many iPhone shots as I do Nikon shots, there are still quite a few. As of this moment, I have north of 2,000 photos in my iPhone camera roll. That may not sound like a lot, but in the last 2 years I have removed at least that many 3-4 times, so the total iPhone library is something like 8,000-10,000. That number is a guess since I am too lazy to look it up, but it's at least directionally accurate. The cool thing is that I always find stuff to process on the iPhone, and I always find things I love when I do that. There's just a lot of content that I am carrying around, and it's awesome to be able to take a few minutes and crank out some artistic stuff. That's one of my favorite things about iPhoneography - processing photos is not a big production requiring dedicated amounts of time. I can get a few shots done in 5 minutes. That's awesome. Anyways, these shots are also from the family trip last summer to France, but from the little town of Amboise, which sits alongside the River Loire as it winds its way through the Loire Valley. It's a picturesque area and the town is rather charming. I loved it there, and would love to go back. In addition to shooting various street scenes, of course I was happy to find a little mural showing good old Leonardo da Vinci, who famously spent time here in his later years. In fact, his tomb is here, up at the castle/chateau which sits on the hill above town. I'll save that spot for another iPhone post at some point. It's pretty wicked. And of course, I went out a couple of times in search of a great sunset...and WOW was I ever rewarded for that idea! Well that's it today folks, thanks for stopping by, and here's one last look at the arch and tower which sits squarely in the historic town center. So much charm here, you really must visit. Have a great day! 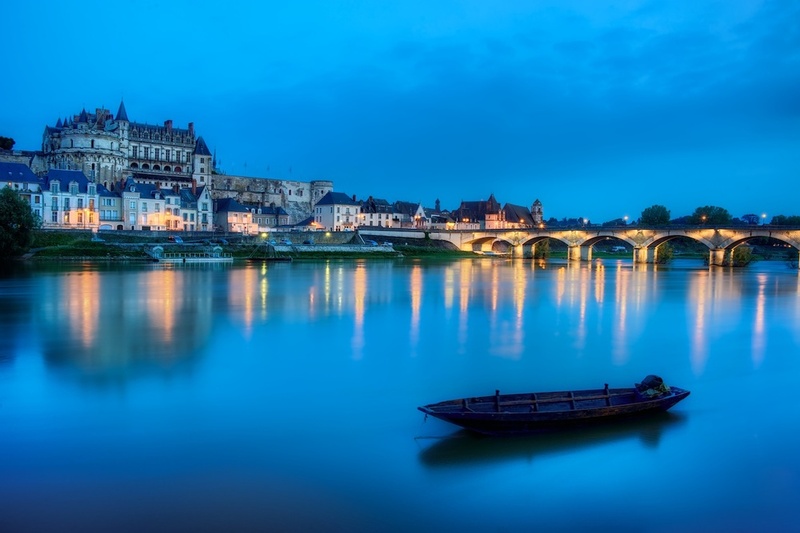 Blue hour in the Loire Valley - great for photography! Ok, that's a little misleading because let me be honest - any time of day in the Loire Valley is great for photography! The place is just so beautiful, even in unflattering light. I shot a million photos there (ok, not really a million, but you know what I mean) at all times of day. And yes, like everyone else, I prefer to shoot at the edges of the day when the light is soft and flattering: sunrise, sunset, and the golden and blue hours. Luckily, you get them all each day! I'm fired up now! I want to go shoot! Anyways, I took the family over to France last summer, and we spent about 5 days in a little town called Amboise, which is situated right on the River Loire in the Loire Valley. It's a great base to explore all this area has to offer (you did read my list of the great chateaux there, didn't you?) and I highly recommend Amboise. Plus it's just charming. One evening I was strolling around taking some of those million photos I mentioned, and stumbled across this little scene. I just loved the golden light and the deep blue hour sky that was all around it. Plus seeing that person in the cafe just made the scene for me. So, I fired away. And well, here is is. I hope you enjoy viewing it as much as I enjoyed taking it! We spent a few days there back in June of this year and totally loved it. It's big enough to enjoy comfortably without being overwhelmed, and you can't beat the location. It's an easy drive from there to many of the incredible chateaux that you probably want to visit anyways: Chambord, Chenonceau, Cheverny...the list goes on. I took this shot one evening after we had settled in for the night. I couldn't stand missing a chance to shoot such a great little town, so I headed out and took a few street scene shots like this one around the blue hour. Blue hour is probably my favorite time of day to shoot, and street scenes (especially in Europe) are quite possibly my favorite thing to shoot...so this was a no-brainer. As you can see, it was already pretty deserted although there were definitely still a few folks out for a late dinner at some of the restaurants nearby. Anyways, be sure and stop in here if you find yourself nearby - you will thank me for the tip! 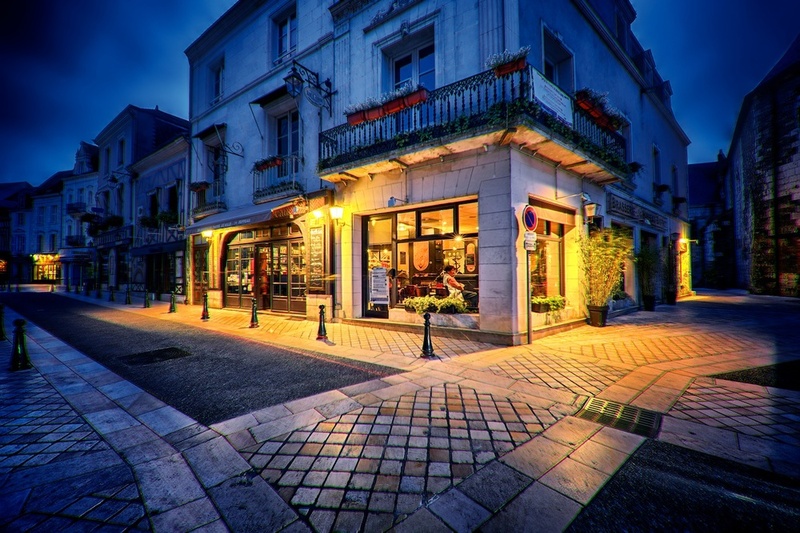 I grabbed this shot one fine evening in Amboise, France which is a wonderful little town in the Loire Valley there. We spent a few days in Amboise during our vacation to France back in June and loved every minute of it. I tend to travel to larger cities for work, so most of my photos are also from cities. But I found that I really enjoyed this little town, as it offers up so much history and beauty, not to mention some incredible architecture. But I also found that if you show up at the right time, you can get some wonderful shots of this famous river as it winds its way through town. I happened to be in the area at sunset one evening, and fired off the brackets for this HDR shot with a big smile on my face. There always seems to be a little magic at blue hour, morning or night. It’s such a special time of day, when everything is quiet and still, noises seem to be at a minimum, and the whole Earth feels like it is resting. I love those moments. I was out one evening in Amboise, a small town in the Loire Valley of France, and had been looking for interesting things to aim the camera at, which isn’t really very hard in this area - there’s something beautiful at every turn in France. Anyways, I started out way across that bridge and behind the Chateau de Amboise which you see in the photo. After crossing the bridge, I saw that little boat anchored in the swift-moving water, and wanted to take a closer look. It took a little fence-hopping and trail-maneuvering, but was well worth it. Interestingly, the boat wasn’t moving back and forth very much at all - must have been anchored pretty well! It wasn’t long before my quiet revelry was disturbed by 3 little French boys who just wanted to make a new friend. Sadly, my French language skills are terrible, so I barely understood much of what they said - apart from the constant “take my picture!”. So I did. 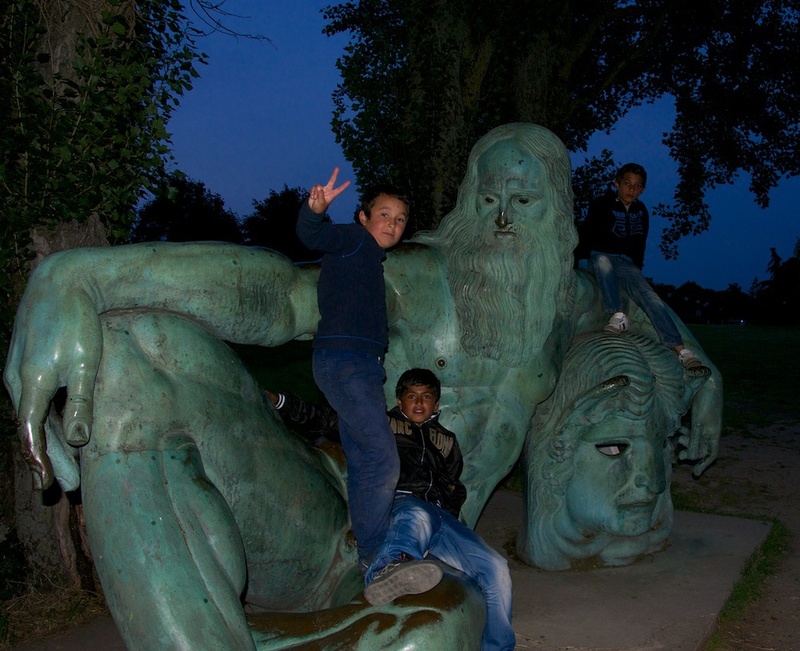 They climbed up on that statue of Leonardo da Vinci and I popped off a quick shot with the flash. It was fun hanging with them actually, even though I had no idea what they were saying. Isn’t this an amazing looking place? I just loved it, but of course I am a huge fan of architecture, and especially stuff like this It just blows my mind. As the title of this post implies, this is inside the tomb of Leonardo da Vinci. He has a burial crypt inside a small chapel which is situated on the grounds of the Chateau de Amboise, in the lovely town of Amboise, which is situated in the Loire Valley of France. Go there now. You can thank me later. Honestly, there was nothing about the entire Loire Valley that disappointed me. I experienced great weather, incredible sights, rich history and friendly people. I saw amazing chateaux, a lovely river, and my camera was clicking like crazy. I ate fabulous food and enjoyed some tasty beverages. I’m ready to move! Just think back to the time when Leondardo da Vinci was around, and the sort of impact he had on civilization at the time. It’s clear this guy was an immense talent and a genius. How do you honor someone like that? I can’t imagine. But I must say that the burial chamber is indescribably beautiful as you can see here. As you can tell from the photo, I was aiming up for this shot because I wanted to capture all the intricacies in the ceiling. The detail there is amazing. Be sure and put the Loire Valley on your bucket list! As I mentioned in my post a couple of days ago, we spent some time in Amboise in the Loire Valley of France. We really enjoyed this little town. Though I expected to enjoy the place, I think I enjoyed it more than I thought I would. I tend to travel to cities the majority of the time, and while I don’t consider myself a “big city” person, I do enjoy seeing big cities. But this little town was just pretty awesome all around, and I am glad we got to spend a few days there. It’s funny how travel open your eyes a bit. You learn things about yourself, what you like, and what you don’t like. It’s interesting. Anyways, the town has a chateau/castle situated on top of the hill in town, dominating everything around it. The guidebooks we read mostly focused on all the other fabulous chateaux in the area (Chambord, Chenonceau, etc) and while they are fabulous, I feel like the Chateau de Amboise deserves a bit more attention. It’s not nearly as large (and certainly not as famous) as the others, but it’s a great place and well worth a visit if you find yourself nearby. Interestingly, it also has the tomb of Leonardo da Vinci there, which is incredible (as you might expect). I’ll save the pics of Leonardo’s final resting place for another time, though. So if you find yourself in the Loire Valley, I highly recommend the town of Amboise as your base, and be sure and visit the Chateau de Amboise when there!